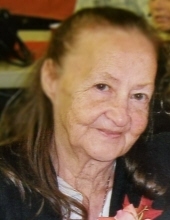 Eileen Hazel Lipke, 81, of Merrill passed away April 8, 2019 peacefully at her home surrounded by her family. She was born January 17, 1938 to the late Merald and Clara Young. On August 3, 1957 Eileen and David Lipke were united in marriage in Merrill, Wi. David preceded her on August 24, 2001. Married to Dave she enjoyed helping him work on his race cars and cheered him on racing over the years. She enjoyed large family gatherings where she took pleasure in taking others’ quarters while playing Polish poker and laughing around the campfires; shooting darts with her friends and family; also spending time on the water fishing with her family. She welcomed many grandchildren and great-grandchildren into her life and spent most her free time entertaining and hanging out with all of them. She retired from Weinbrenner after 34 years of service. Eileen is survived by her daughter, Linda(Ken) Gaydos, Tomahawk; son, Larry(Edith) Lipke, Merrill; daughter, Lisa(Robert) Kleinschmidt, Merrill; and son, Leslie(Deb) Lipke, Florida; grandchildren, Amy Lipke, Angie(Andrew) Malm, Ken Gaydos Jr, Samantha Geiger, Beckie(Donald) Gennrich, Anthony(Stephany) Woller, Amanda Woller, Danielle Woller, Jeffery Finnigan Jr, Austin Lipke, Daniel Kleinschmidt, BJ(Casandra) Lipke, Tommy Lipke, Stacey(Matt Wallace) Lipke, Sara(Travis Albrecht) Lipke and Leah(Derrick) Lemke; and great-grandchildren; David, Zach, Dylan, Noah, River, Jordan, Taylor, Madison, Mason, Caleb, Zachary, Savannah, Maelyn, Amelia, Lydia, Zander, Alexia, Kendall, Samara, Parker, Dawson, Kennedy, Liam, Jax, Danica, Amiya, Carson, Kamden, Zachary, Lacy, Ella and Aubree. Eileen was preceded in death by her husband, David Lipke; parents, Merald and Clara Young; siblings, James, Luella, Ila, Elwin ‘Al’, Merton ‘Mike’, Harland, and Baby Rosie; and great-granddaughter, Sabreenah Woller. A celebration of life will begin at 1:00 P.M. on Saturday, April 27, 2019 at S&S Banquet Hall, Merrill. Taylor-Stine Funeral Home & Cremation Services, Merrill is assisting the family with arrangements. To send flowers or a remembrance gift to the family of Eileen H. Lipke, please visit our Tribute Store. "Email Address" would like to share the life celebration of Eileen H. Lipke. Click on the "link" to go to share a favorite memory or leave a condolence message for the family.